Wimbledon, Day 9 – Who would have thought that Venus Williams would keep her cool and dominate with her forehand? We all know that Venus has won five Grand Slams at Wimbledon, but she hasn’t won since 2008, which is a long time. However, Venus never gives up, and I mean never, ever gives up, because in the past 20 years, even when she wasn’t playing well at all, she continues to try. It is so, so true. Others bail, but not Venus, who figures that once in a while, when her form returns, and she can crack it deep, touch the lines, crush a first serve, then she can beat anyone, which she did on Tuesday. Williams defeated the Roland Garros champion Jelena Ostapenko in two sets. Ostapenko is super young, and she still needs to learn the nuances of grass. Eventually, she will win Wimbledon someday. But not yet. 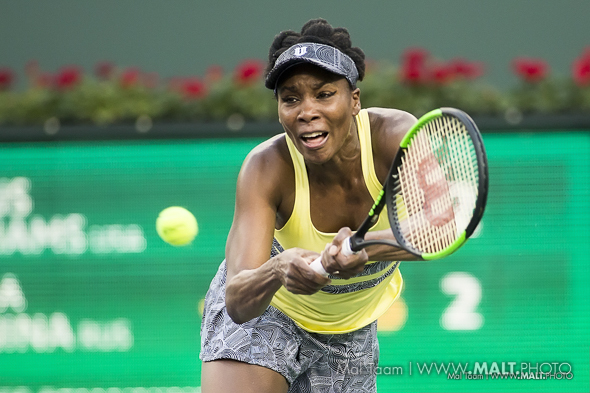 Venus has to face Britain’s Jo Konta, who overcame Simona Halep in three fantastic sets. There is a good amount of pressure from Konta, but when she is playing, she doesn’t listen to the fans yelling when she is hitting the ball; she locks in and she focuses. That is why she has reached the semis, the first time for her in ages. Can she beat Venus? Possibly, as she is much younger than the 36-year-old Williams, and we all know that the British fans will be jumping up and down for Konta. They will be celebrating Konta reaching Wimbledon’s second week — for the first time ever. The fans are learning who she is. Is Konta fast, super aggressive, happy, smart, erratic, super nervous, in trouble? We will find out on Thursday. We have been watching Garbine Muguruza pretty closely over the past eight weeks. Yes, for a year, her brain was all over the place. But eventually, at Roland Garros, she rose, she didn’t get angry. Now, she is more patient and has begun to she believe in herself again. She bested two-time Grand Slam winners Angie Kerber and Svetlana Kuznetsova, and now, she is in the semis. Muguruza is favored to reach the final, but you never know. Not with her. She can rip her forehand and backhand, but there are days when she doesn’t like her racket and could snap it. If the Spaniard is calm, she will win. She is that good. She will play Magdalena Rybarikova, who upended the American Coco Vandeweghe in straight sets. Rybarikova has never reached the semis before, but the veteran plugged on. Against Vandeweghe, she hit it deep and she mixed it up all over the place. It took her eight years to reach the semis at the Slams, and finally, she understood that she needs to be patient, and also, swing away when the opportunity rises. She better do all these things, or Muguruza will crush her. For the second time in two Slams, Halep had one match to win to ascend to No. 1. But, with the loss to Konta, following the slip in Roland Garros’ final to Ostepenko, Karolina Pliskova will be ranked No. 1 next week. She will be the 23rd top player in WTA history.